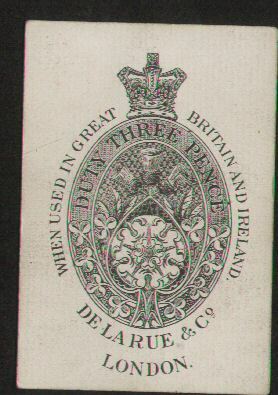 Small size 56mm by 84mm with Old Frizzle Ace of Spades. 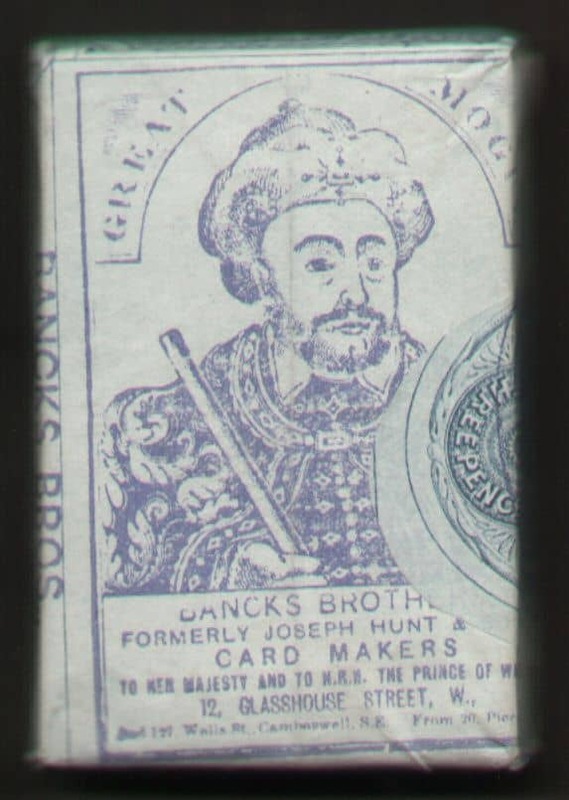 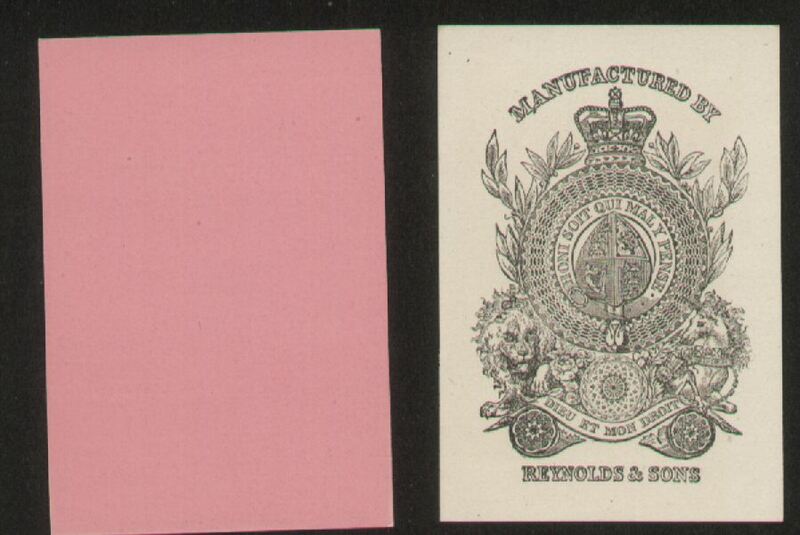 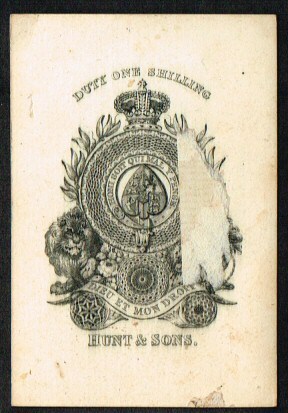 The Court cards are of an earlier period of Hunts/Gibsons and we assuming that this pack was recreated to mark the Coronation of Queen Victoria. 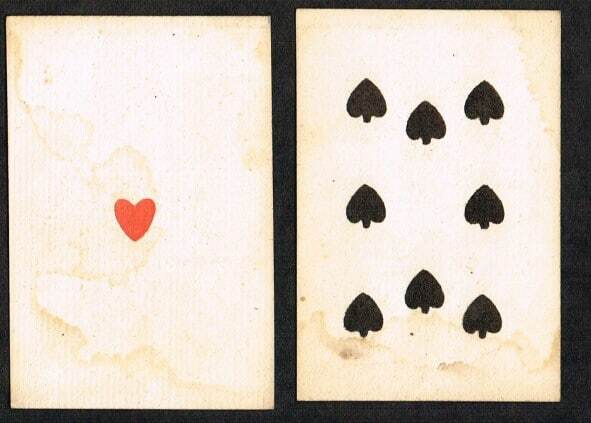 The cards have been exposed to damp but they are still as intact as they ever were with no separation. 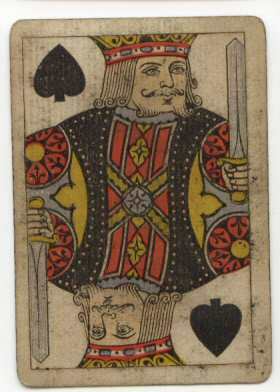 The Ace of Spades has a paper fragment attached to the face. 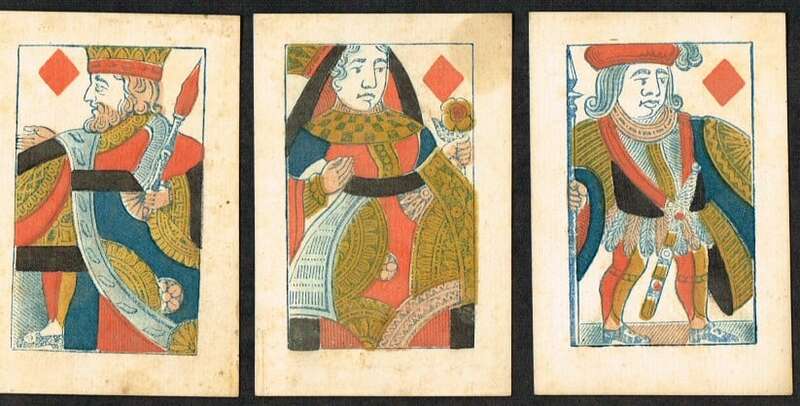 The Queen of Diamonds has some damage to the top left corner. 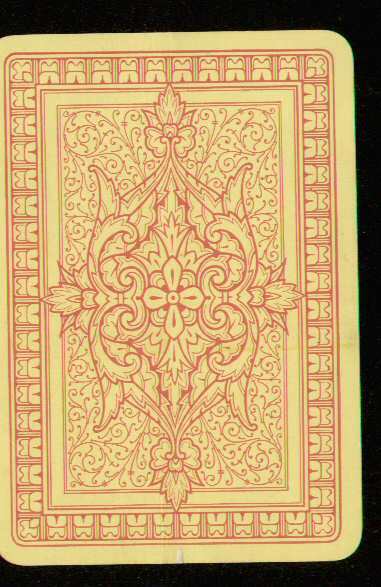 There are a lot of surface marks but given the rarity of this deck we adjudge the markings to be minor. 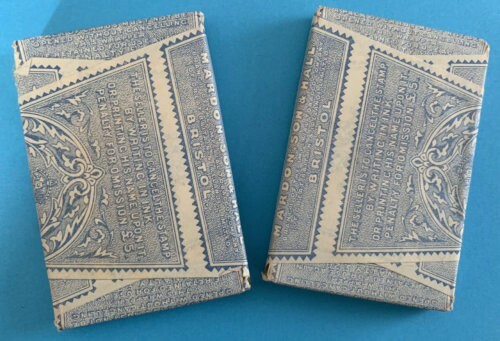 A piquet pack, full deck 32/32 cards. 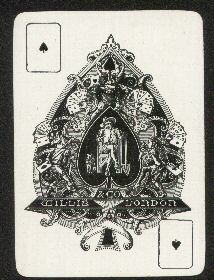 Small size 56mm x 84mm with Old Frizzle Ace of Spades. 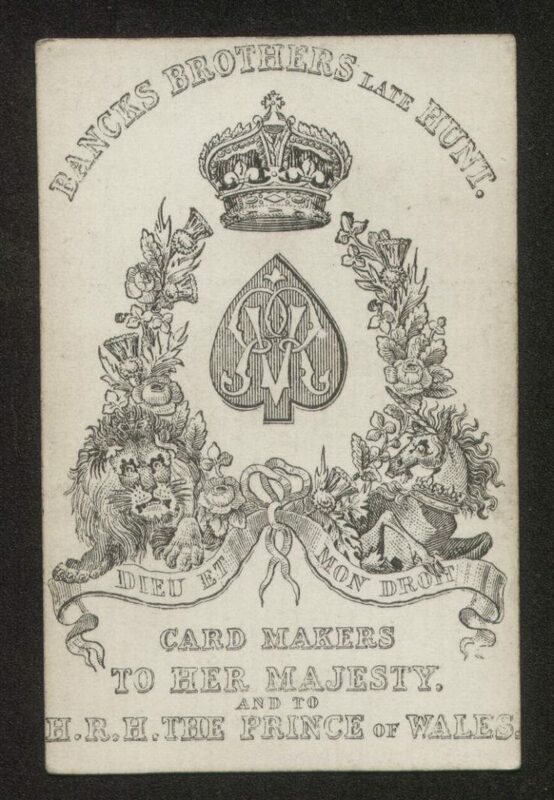 The Court cards are of an earlier period and reflect the designs of Stopforth leading us to assume a celebration pack of cards Queen Victoria’s Coronation. 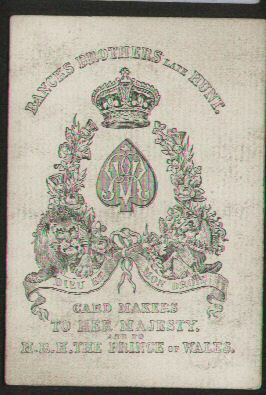 There are a lot of surface marks, more evident on the pip cards given the rarity of this deck we adjudge the markings to be minor. 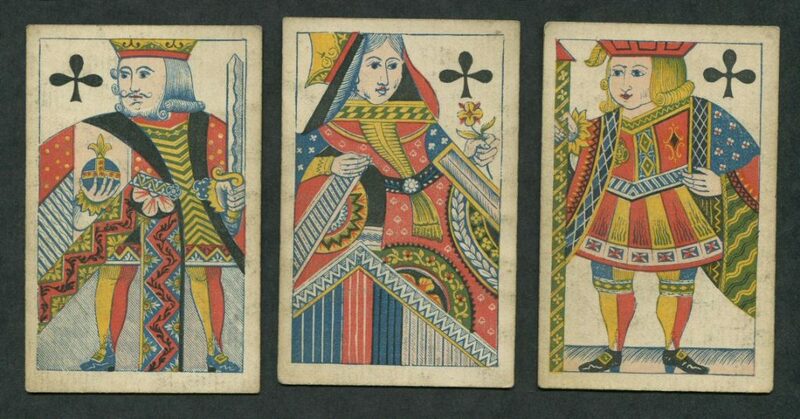 The Deck is complete . 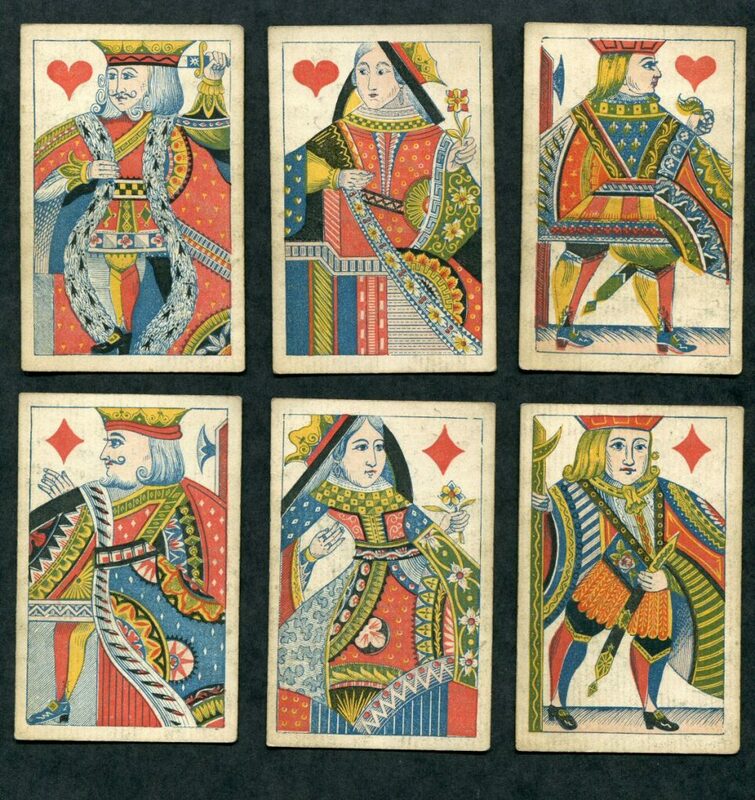 The cards are smaller than usual – continental sized with Continental / French pips – full length courts that are very decorative. 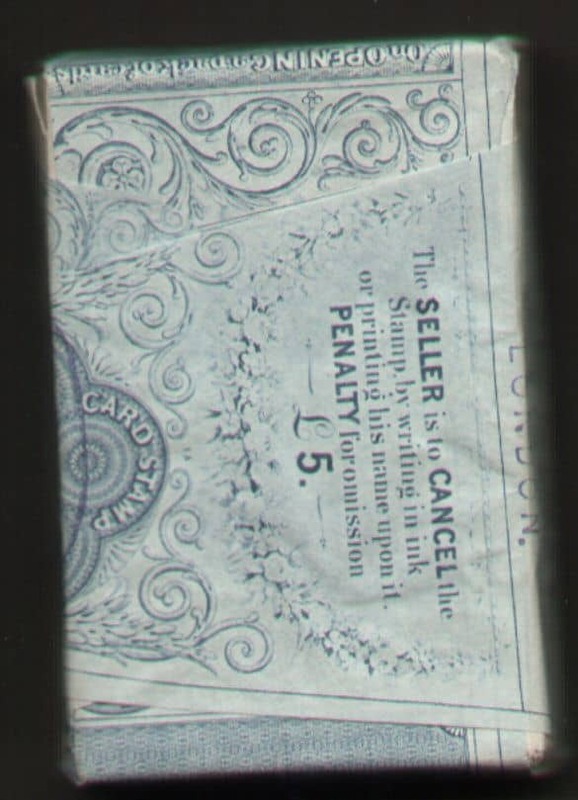 The tax wrapper is a solid type and Reynolds have printed their name on it. 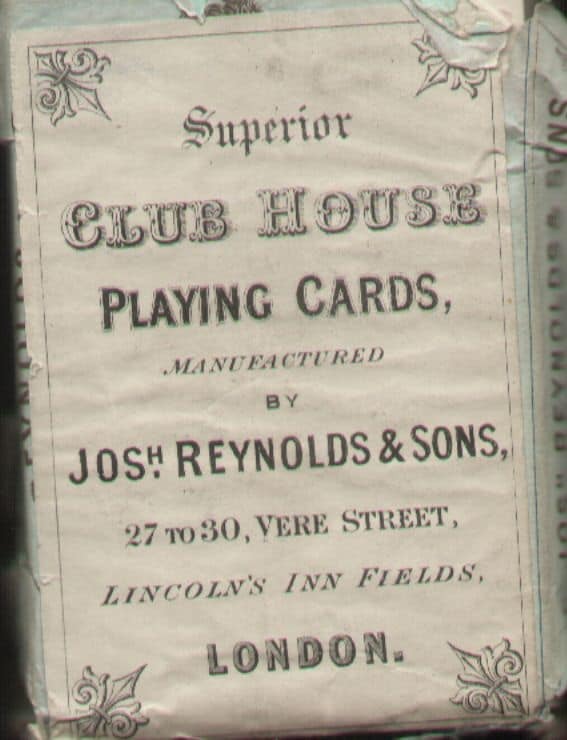 Cards (52/52) are mint – wrapper is torn and parts are missing but still very interesting. Cards have been very lightly used. 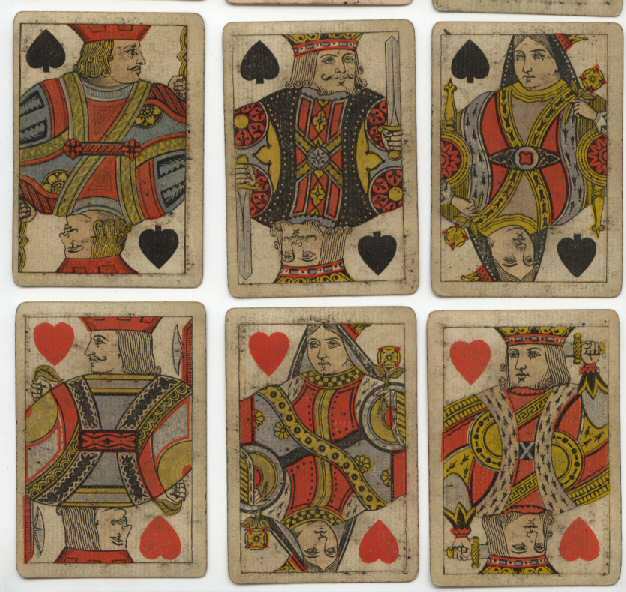 Cards are complete 52/52 and measure 54 cms by 83 cms (frame of courts measures 49 cms by 76 cms). 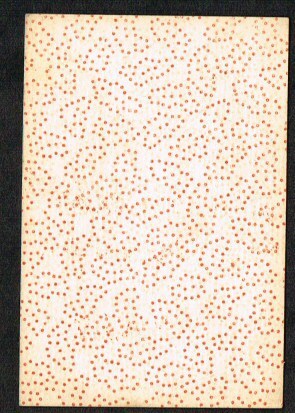 Condition is very good light use – no damage but slightly grubby on the glossy backs. 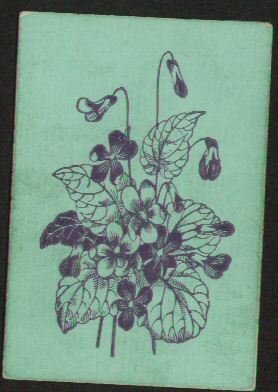 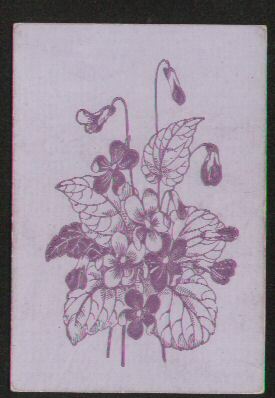 This consist of two packs of playing cards (32/32) identical backs with beautifully drawn pansies in purple, the other pack with a green background. 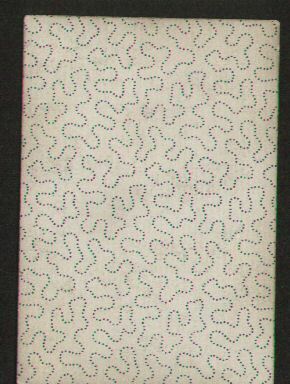 Courts are double ended, turned, no indices, square corners. 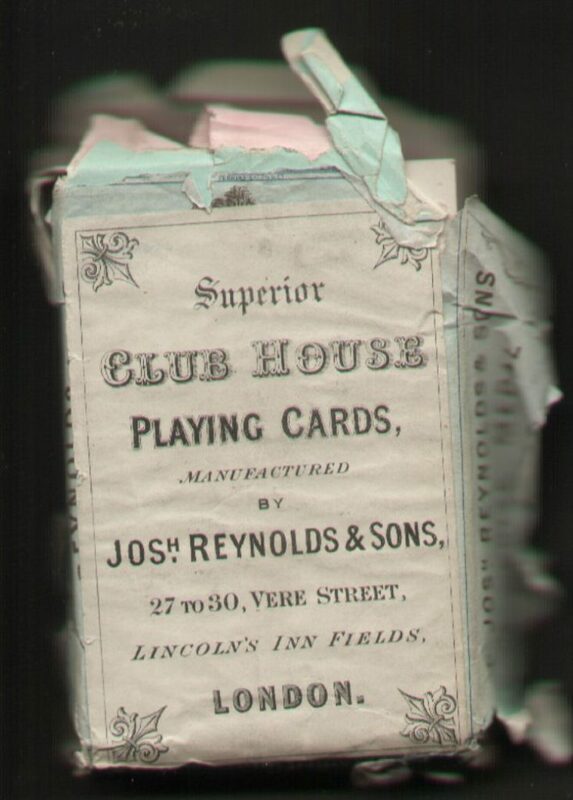 Cards are in good condition, lightly used – no damage. 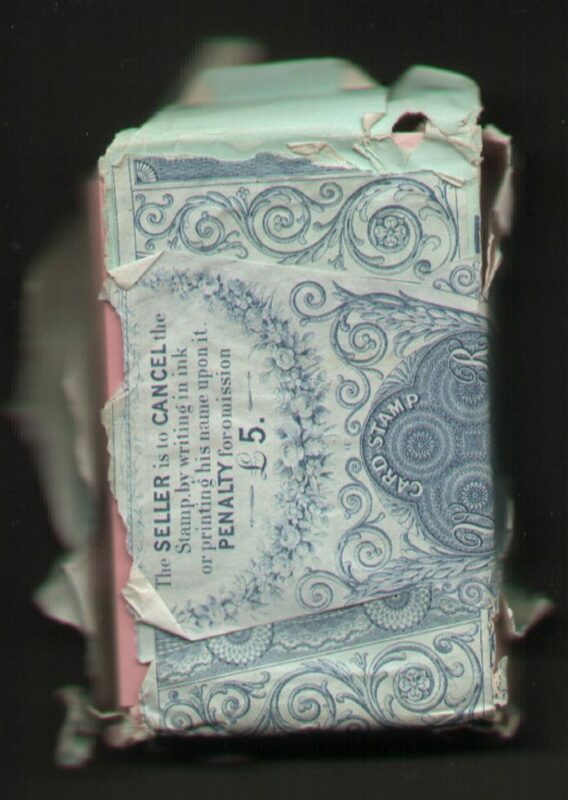 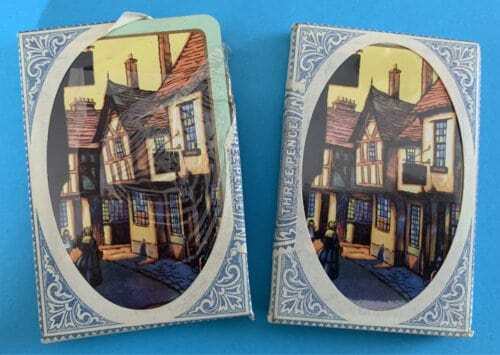 These cards are smaller format than usually – we assume complete and mint as the wrapper is undamaged – the cards are as sold over 130 years ago. 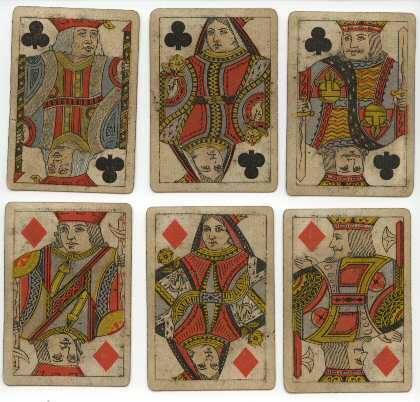 This piquet deck of playing cards (32/22) have interesting indices – they are mini pictures of cards in each corner. 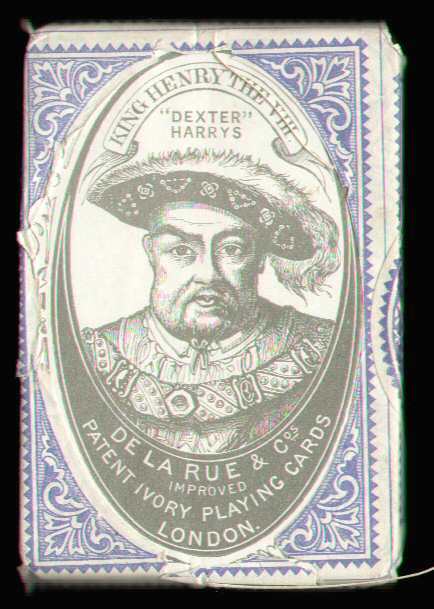 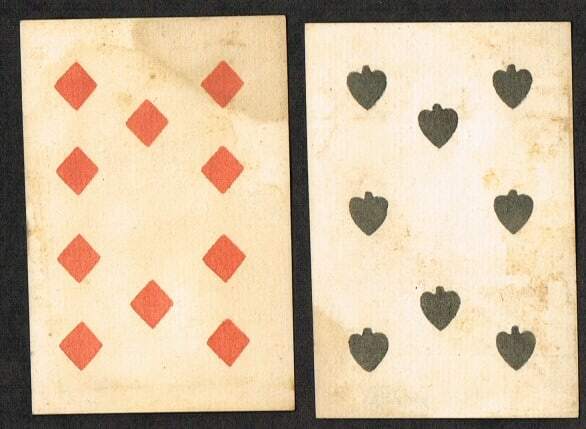 They produced these miniature indices on two different sets of cards – once with normal turned courts over the pip and this deck – which seemed to be produced a year later where the indices are turned and the pips placed in the other corner. 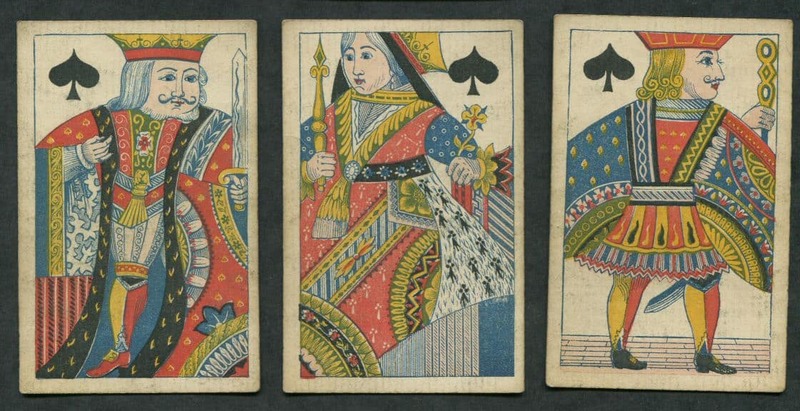 This deck of playing cards (52/52) are without indices and have courts with an unusual colour and pattern – with a lot of turquoise in the design. 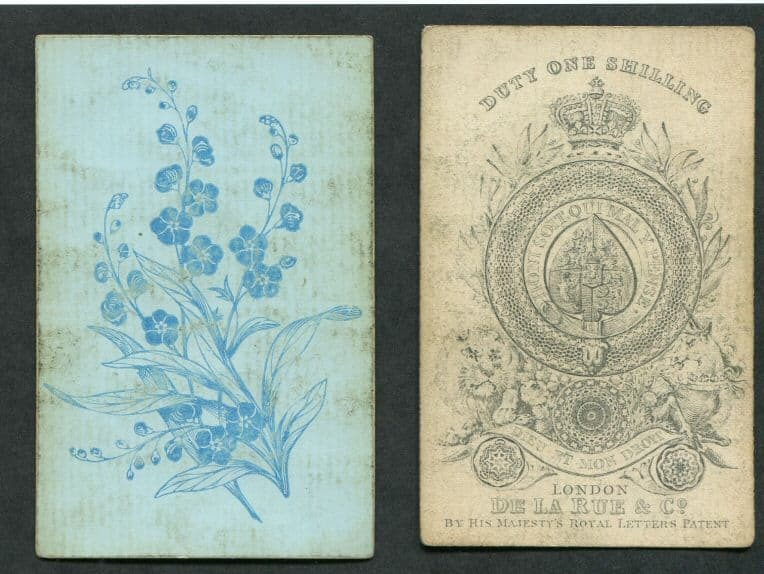 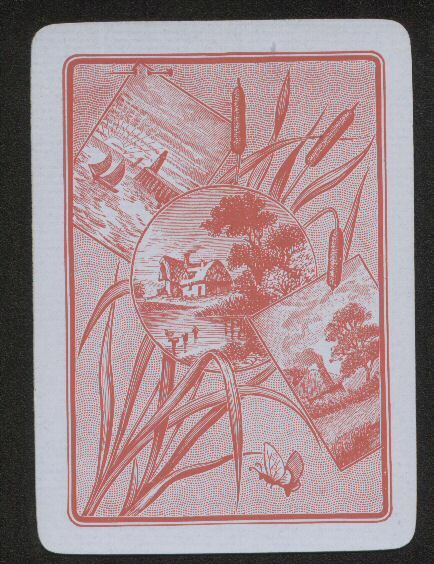 The cards are undamaged but dirty due to use – cleaning should be possibly with this type of soiling.